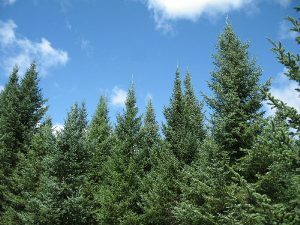 More than three decades ago, several members of the Maine Christmas Tree Association (MCTA) decided that in order for them to be competitive into the next century, that they had to initiate a strand of “superior” Balsam Fir from which seed could be collected and distributed to members for their growing needs. After much planning and work, MCTA has two seed plantations located at different sites in Maine. Two large seed harvests have been completed to date. Seed from each parent tree is being grown and out-planted for further study to eventually identify the true “superior” Balsam Fir. These three crops of “better than average” seed are being grown and distributed by Downey Nurseries as the organization’s contract grower. These superior trees are available now for members of the MCTA. Hopefully these trees will give Maine growers the competitive edge they need to be successful.